These authentic extra plush hotel and spa hand towels are made from high end Turkish cotton with a unique soft twist texture. The 750 gram towels are made for five-star luxury hotels and spas and become softer and more absorbent with every wash. Wow!! Impressive. This is the finest towel I have ever used. Reminds me of the towels at the Mandarin Hotel in Bangkok. Soft and lush. Not too thick which I like since they dry a little quicker. There is lint when drying but I noticed the towels get better with each washing. They were delivered very quickly and I could not be happier. I think I will buy the White ones to coordinate. Thank you Overstock! Handtowels are the bane of any B&B... often too flimsy, and don't stand up to the demands of a shared bathroom situation. These plush towels are a terrific solution, thick and plush feel, with an ideal contemporary color that stands up to repeated use between launderings. Love my new soft green towels! towels are great. thick & absorbent. only down side (which is hardly a down side) is that the trim on the front side of the towel is minimal. i expected more of a border which would delineate the front from the back of the towel. they have a nice edging but you don't' see it unless you pick it up and feel for it. as i said tho, this is the most minimal of complaints. Purchased these for our new fifth wheel. I love the color and they are very soft. They wash well and look amazing. I'm so glad I chose this color. I also purchased the bath towels and washcloths in the same color. So very satisfied. I absolutely love these hand towels. I also have the bath sheets and wash cloths. Exceptional quality and the best I have ever had the pleasure of owning. Very good quality towels. They didn't leave too much left in the dryer. Also they are quite absorbent. The green has a slight gray undertone but they work with my colors. They match perfectly to the towels I ordered separately. I would buy them again. Excellent quality, pretty color purple and nice and thick and absorbent. Nice quality, pretty color in blue. Beautiful, plush and highly revommended! I bought these as a gift for my sister. She loves them. Great quality and beautiful colors. I am buying more for a couple people this Christmas. Look forward to receiving them. Based on the reviews, I decided to take a chance and find out for myself if they were as good as the reviews said they were. "I am interested in these towels. I see there are hand towels and bath towels, but I can't find matching washcloths. Are the washcloths available ?" Hello linda1987, These towels have received excellent reviews! Unfortunately, we don't have the exact matching wash cloths individually. 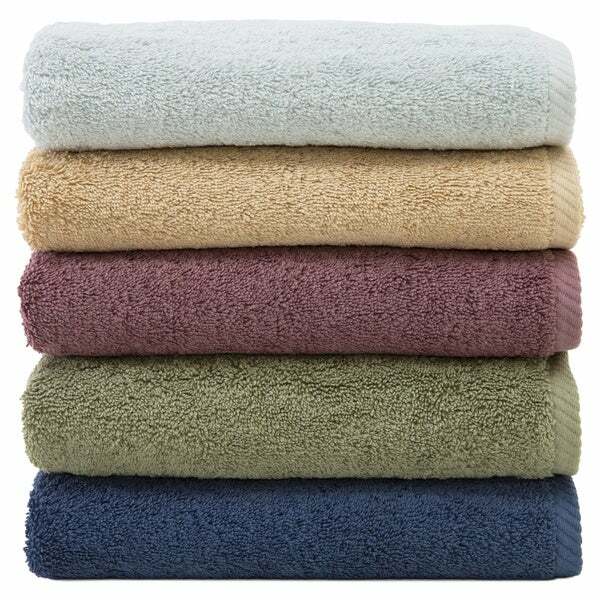 Item 15019962 is a set of these towels that does include a wash cloth. I hope this information helps. Thanks for shopping with us.